Jessica and Christopher’s wedding day was a delightful garden gathering with timeless details to celebrate the sweetest love story. The glowing bride wore an Allure wedding gown with stunning lace details and an open back – so beautiful! She shared a darling First Look with her father in our bridal suite – no one could hold back tears as he helped put on her veil. After that heartfelt moment, Jessica met her husband-to-be in the garden in front of our iron gates. She tapped Christopher on the shoulder, and he turned around with the biggest smile for his future wife! 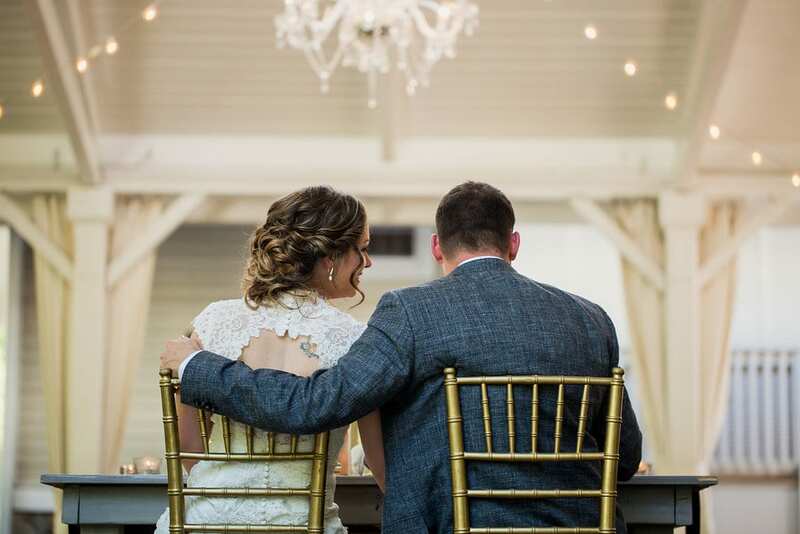 Their intimate ceremony in the garden was followed by dinner and dancing in the pavilion, where the couple dined amongst gray farm tables while seated comfortably on gorgeous gold chairs. The evening ended with a sparkler sendoff with family and friends wishing the couple the sweetest Happily Ever After. Thanks to Carrie with John Myers Photography for capturing the details of this wonderful day!